Her pregnancy was what some might call textbook. For 33 weeks, she felt as though she had “magic” running through her veins! 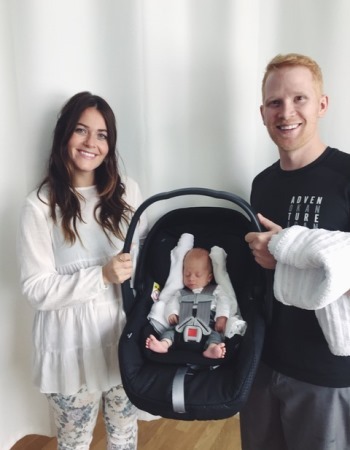 So when she felt those first few contractions to let her know that her baby was on its way 7-weeks earlier than her expected due date, she and her husband Ryan didn’t even have time to process. They needed to deliver their baby. 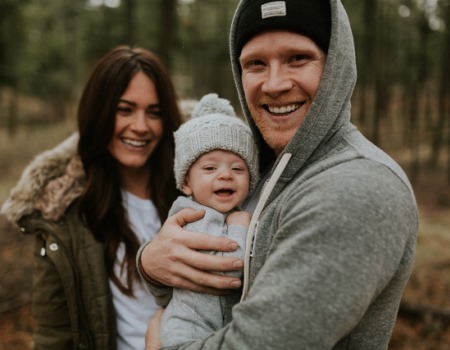 Jaclyn Robertson, mom to baby Indy and co-owner of the wildly successful local lifestyle brand, Okanagan Lifestyle Apparel, shares her story of love and light in the Neonatal Intensive Care Unit (NICU) at Kelowna General Hospital, in her own words. “I was admitted into the hospital on a Friday evening wearing bright pink lipstick and a dress. Hardly prepared for labour! We were just going in for a test. Indy was born Sunday afternoon after an intense but beautifully natural 45 minute labour. Yes, minutes!! He’s a boy on a mission our little guy! Luckily the only “complication” that arose once we learned I was in preterm labour was that the doctors weren’t able to slow my contractions down to prolong my pregnancy despite their best efforts. In hindsight I suppose this was a sizeable complication considering the circumstance. I absolutely found myself wishing I hadn’t skipped the “What To Do If You Have a Premature Baby” section of my books! It never dawned on me that this would be our story. As a soon-to-be mother I felt as though I had studied all the wrong material and was about to fail one of the biggest tests of my lifetime. I feared the unknown. But mostly I feared the health of our unborn baby. Despite the worries that inevitably crept in I had a deep seated knowing that our son was healthy and in amazing hands. I might have felt tremendously overwhelmed getting wheeled into the NICU after giving birth had it not been for the warmth of the nurses on duty and the state-of-the-art equipment they had on hand. It was easy to see our son was in the best place to receive what he needed to thrive. The kangaroo chair felt like heaven on earth in the early days. Essentially it’s a chair designed for breastfeeding mamas. We celebrated the small successes. Especially under our circumstances – feeding a 3 lb baby quite literally took a village – between tube feedings, bottles and breastfeeding! Our doctors don’t know why Indy was born premature. Such is the case with many premature babies. My husband and I often joke that he likely didn’t want to miss out on a beautiful Okanagan summer! Little did he know arriving almost 2 months early meant that the three of us would spend his first summer adventuring the KGH NICU instead of the Okanagan Valley! There’s no doubt in my mind our experience would have been very different had Indy been born before the new KGH NICU was able to accommodate us. We would have spent the first months of parenthood far from our support system and living out of a hotel. We are very lucky to have the privileges that we do.